Someone may be having a little too much fun this campaign season year. The two books are Trump's Crippled America, and Carson's A More Perfect Union. Other works on the same shelf are the humor books Hillary Clinton Haiku: Her Rise to Power, Syllable by Syllable, Pantsuit by Pantsuit and WTF?College. It's not clear who moved the books, but the most likely possibility is that someone (the original source, or perhaps a B&N employee?) is having a little bit of fun. 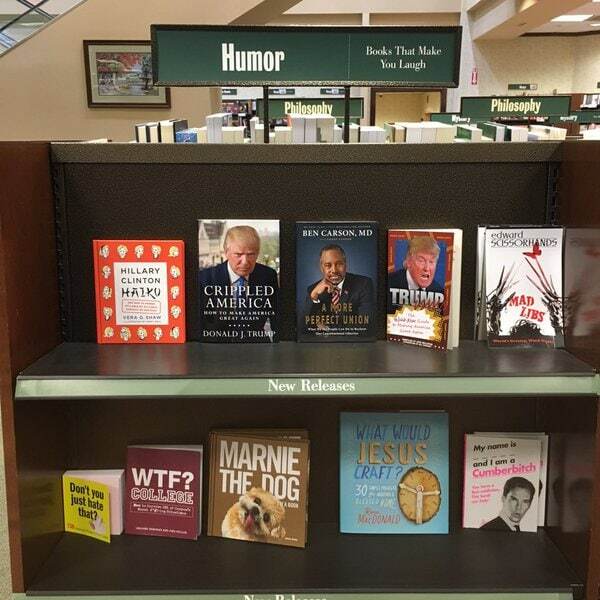 On second thought, this likely wasn't a B&N employee; they would have been more thorough, gathered more titles from both ends of the spectrum, and shelved them in the correct alphabetical order. Just about the only one I would think is clever is the mystery section; the rest are stale jokes (or in the case of Twilight, an actual error by a B&N employee). When I managed bookstores, we used to sometimes practice creative shelving, like a book on the Bermuda Triangle in Travel/Caribbean. This sly joke would not have been at all beyond my crew. All books by politicians belong in True Crime. LOL I think we can all agree on that. So I would find Hillary’s book in the Horror aisle?